Amulets and talismans are not the same thing, but they’re closely related. An amulet is protective, whereas a talisman mainly brings good fortune–though of course it may dispel negative energy as part of the package. A talisman may be a piece of jewelry, a stone carried in your pocket, a lucky coin, or anything else that carries personal significance. 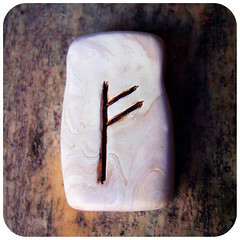 While many things make fine talismans, lots of people choose crystals, runes, or a totem animals. A small totem or religious symbol carved from stone combines luck from two sources. Crafting your own talisman is especially lucky, but buying one is also fine, as long as you fill the item with your intention. What is intention? Simply the purpose you have in mind for the talisman. For example, if you want to attract love, it’s not enough to purchase a rose quartz heart and throw it in a drawer. You will need to focus your will on the specific thing you want your talisman to do. This may be a one-time purpose–say, finding your true love–or may be some general purpose, like developing a more loving attitude within yourself. Think of each talisman as an individual; it has a personality, and the two of you are going to have a relationship. 1. Cleanse the talisman: Once you get your talisman home, set it either outside or in a moonlit windowsill overnight. In the morning, sprinkle a little salt over it, then hold it under running water. 2. Charge the talisman: Hold the talisman with cupped hands, focusing your concentration on it. Allow energy to flow in from the Universe, while at the same time directing your intention through your touch. You may also call on deities or spirit guides to help. 3. Knowing when the talisman is ready: You may be able to feel this directly as you work with the talisman. If you sit half an hour and still don’t feel an energetic change, it could mean you need more than one session to charge the talisman. Or if you have one, a pendulum can help you know when the talisman is charged; simply hold your pendulum over the talisman and ask if you’ve fully communicated your intention. 4. Using the talisman: Whether you carry the talisman or keep it in one place depends on its purpose. A talisman to attract money might stay on your desk if its main purpose is to help your business; however, if you wish to attract abundance to yourself more generally, you’d want to wear the talisman or carry it in your pocket. For most purposes, consistency is important–keep the talisman either with you or in its honored place as much of the time as possible. Here’s a chart to help anyone interested in choosing a talisman. Please keep in mind that this is simply a brief listing; most of these items have more than one purpose, and most of the purposes could have more than one charm in each category.